I love reading even though I don’t often share what I’ve read. But for 2017 I’m planning to share a book every month or so, starting with The Life-Changing Magic of Tidying Up. 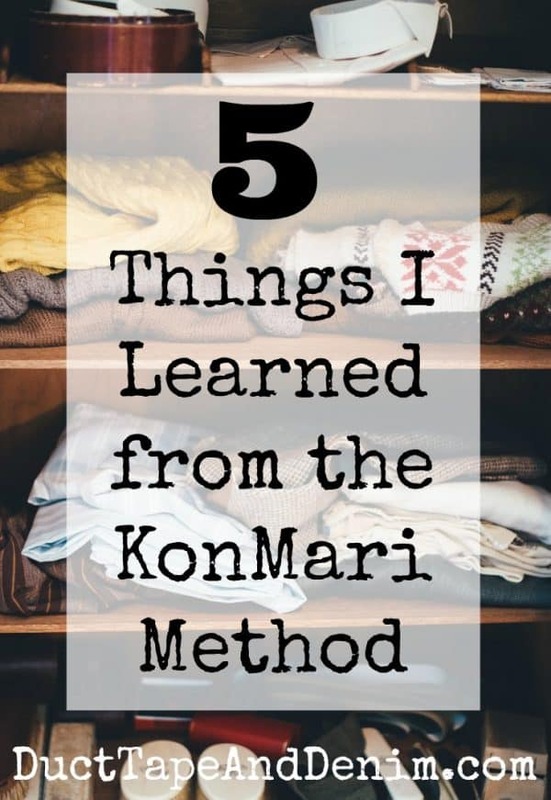 I’ve had several people tell me about the KonMari method and I’ve seen it all over the internet, so I bought and downloaded the Kindle version onto my iPad mini to read on the plane when we went to Canada. Just in case you want to know up front, yes, I did like the book and I do recommend it. I think there are a lot of things you can glean from it. But as a word of warning, the author, Marie Kondo, does have a very different worldview from most of my readers. I’ll tell you about that as I go through a few of the things I picked out from the book. Paraphrased from a graphic I saw on Pinterest. Couldn’t find the original source. Leave a comment if you know. The author and I agree on this point but disagree about WHO to be thankful to. For example, every day when she gets home from work she tells her shoes and coat, “Thank you for the good job you did today.” As a Christian I should be thanking God for providing those things for me, not the things themselves. But this was a good reminder that I should be more thankful, even for the little things like having a warm coat and more pairs of shoes than I really need. This is the first things I’m going to try from this book. I’ve always chosen a room to tidy. The author recommends you gather EVERYTHING together in one place so you can see how much you really own. We usually have too much stuff because we don’t have an accurate account of what we own. She then explains the correct and easiest order to tidy. I completely agree with the order she lists and why. She also has some unique ideas about folding and hanging clothes. I’ve already changed some of my folding habits and it’s working really well for me! She also shared a few other great ideas including vertical storage and how to eliminate the need for off-season clothing storage. At first I disagreed with this comment. Until I read on and saw that she recognizes two types of tidying: “daily tidying” and “special event tidying”. What’s described in this book is the “special event tidying”, kind of like spring cleaning. You’ll still need to do a daily “pick up” around the house. This is actually something I’ve done before. I collect paint-by-number and other amateur oil paintings that my hubby, aka “Bikeman”, calls “ugly art”. He didn’t like it hung in the living room so I hung them all in my closet so I could still see them every day. If you’re not quite ready for such a drastic change, here are a few other decluttering books I’ve found. BTW, Ruth Soukup is one of my favorites! Similar items should be stored together. Most of the time. But I have two bathroom so I will still be storing toilet paper and window cleaner in two places. I can see having a portable basket of cleaning supplies to take from room to room but I’m going to keep some cleaner upstairs AND downstairs. “Treat your socks with respect.” Hmmm… I was raised to take care of the things I had but she goes even further and says that your socks need to rest in the drawers after working so hard during the day. And that you should touch the clothes in your drawer from time to time to let them know you care and look forward to wearing them again. Sorry, I’m still gonna roll my socks into “potato shaped balls”. I would love to hear what you’ve been reading. Leave a comment and let me know what you think I should read next. I love number five and need two revisit my closet next month. This is probably the best review of this book I have read. It’s been on my “must read list” forever now. I’m on the fence about it now. 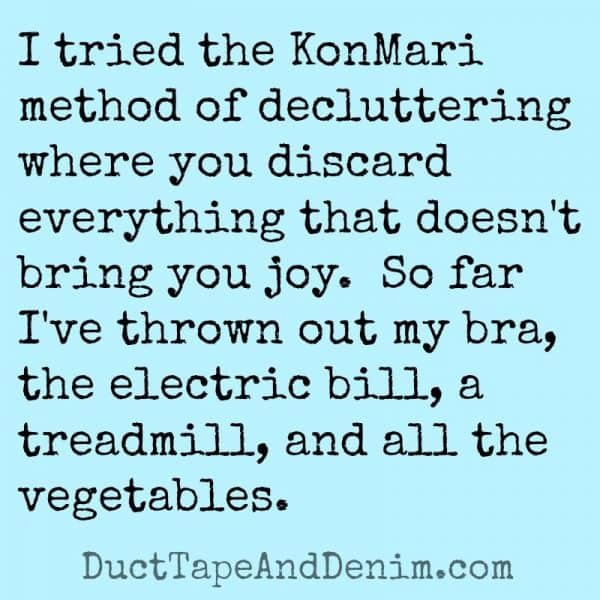 Great review I had seen the term konmari before but didn’t really know what it was about. never heard of the method. I am curious about the folding. No way could I ever take everything out of the house at once….it would take a team of people and several yards. But I do need help so there sounds like some good advice for me. I may check it out after all. thanks for the heads up on the worldview. I’m with you, the coat and shoes don’t have a brain so why thank them? God does provide all my needs so definitely need to remember the daily gratefulness. Ann, my word for 2017 is DECLUTTER and I could get lost in your affiliates! Gotta grab this great read! Loved your review!! And I find it very interesting that we came to such similar conclusions on the book. Lots of good ideas and tips, but some a just a little wacky.???? Thanks for sharing! Usually I am good at organizing, but lately I have hit an “organizing wall.” Keep or dispose…that seems easy enough.